Polarquest2018 tested the use of commercial low cost mini-drones as scientific tools for field research in the Arctic. Our dedicated drone team deployed a fleet of three small drones (two mini-drones below 2 kgs of max take-off weight, one micro-drone, below 300 grams) in several scenarios on the coast around the Svalbard archipelago, above 78 degrees N latitude. Mini and micro drones are especially suited for efficient and low-cost survey of remote and typically inaccessible areas such as the Svalbard archipelago, both on land and sea environments. This project - known as AURORA - aimed to develop efficient and cost-effective observation methods. This was accomplished with observations of ice-cover variations (comparing with archived data), land conditions, vegetation, floating ice distribution and presence and behavior of fauna, including polar bears. Surveys included photogrammetry, photo/video footage in the visible light as well as multispectral and thermal imagery to be used in different types of analyses. The objectives of the AURORA project conducted on board Nanuq by prof. Gianluca Casagrande of the European University of Rome and the Italian Geographical Society have been fully achieved. 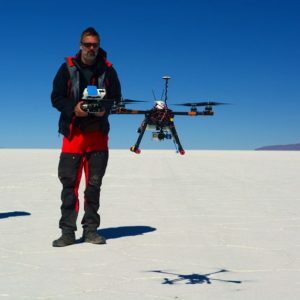 “Using our low-cost drones and citizen science sensors, we were able to carry out expeditive, high-resolution mapping and thermal and near-infrared observations of remote and scarcely visited areas all around the archipelago,” says Casagrande. “Our tools proved effective both for scientific data acquisition and for communicating Arctic environments.” One of the surveys had a special symbolic value, as it produced, for the first time, a detailed 3-D rendering of Alpiniøya, the island discovered by Italian officer Gennaro Sora, who was in the area on his way to rescuing the survivors of the ITALIA airship crash in 1928. Read more about the AURORA project in our update: "Creating a 3D model of Alpiniøya island"